My wife and I were both professors of psychiatry at UC Irvine until we retired from academia a few years ago. Before that I taught at the University of Chicago and then at UCLA. I still work as an administrator for the VA in Long Beach and will probably continue to do this for a couple of more years. For fun we do a lot of camping and hiking, regularly at Yosemite but we get around all over. We used to do backpacking but my knees will no longer permit this. 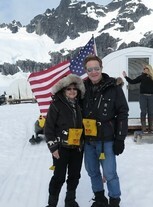 The NOW picture was taken in June 2016 at the dogsled camp on the Mendenhall glacier in Alaska. The other photo is the summit of Mt Dana that we climbed in 2014. In the winter we ski several times per season at various places but at least once at Park City. We also travel quite a lot in the US and elsewhere. Edward DeMet posted a message on karl Meisenheimer's Profile. Hi Karl, we have a time share in Las Vegas and would love to see you some time. edemet@cox.net I regret loosing touch and have tried to look you up from time to time. Edward DeMet added a comment on his Profile. Edward DeMet updated his profile. View. Edward DeMet added a photo to his profile gallery. Edward DeMet changed his profile picture. Edward DeMet changed his "Now" picture.